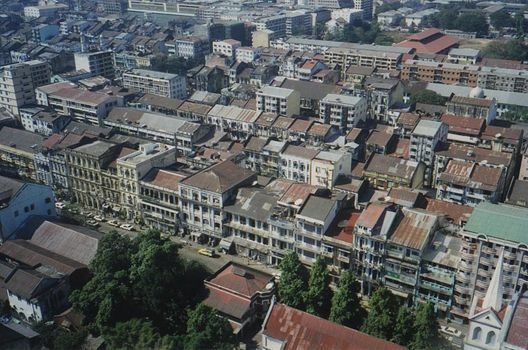 Rangoon, or Yangon as the government prefers it to be known, is miles behind the capitals of other Asian countries. 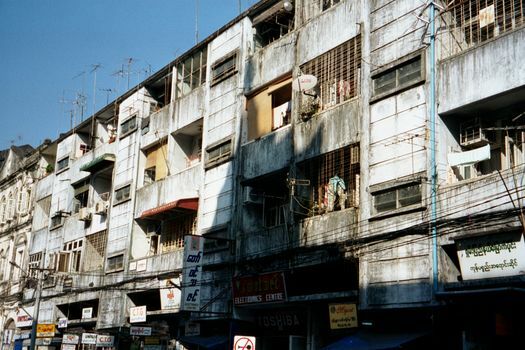 This is partly a consequence of Burma's post-independence choice of economic self-sufficiency. It's also partly a result of the government's ineptitude at doing anything besides retaining power and selling resources. On top of all that, investors have stayed either because of sanctions or their own caution, with the exception of Thai and Chinese investors who can't understand the fuss about ethics. 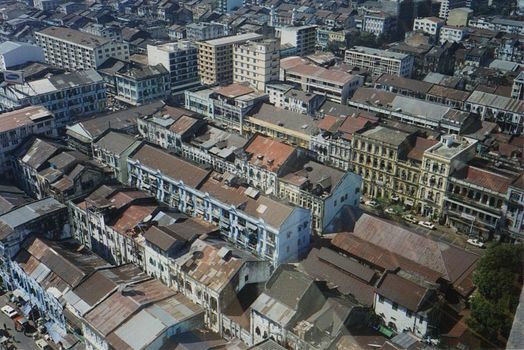 Rangoon in this way has become an unintended museum of colonial urbanism, like Calcutta and Dhaka but more so. 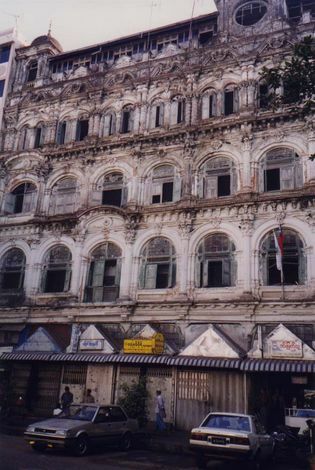 The British moved the capital of Burma here from Mawlamyine (Moulmein) in the early 1850s. 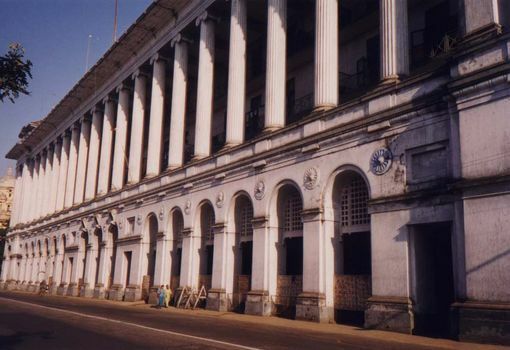 Under the direct supervision of Lord Dalhousie, they laid out a network of gridded streets along the Rangoon River. The result was a paragon of geometry, with superblocks measuring 800 by 850 feet and rimmed by major avenues. The longer dimension was to accommodate a 50-foot street bisecting the superblocks, which were then each trisected by 30-foot streets to create narrow but long blocks. Like street patterns around the world, this one proved ineradicable: you see it here, 150 years after Dalhousie. We can walk down to the river. Behind us, the tidy grid runs along the river for about three miles with a depth of less than a mile. 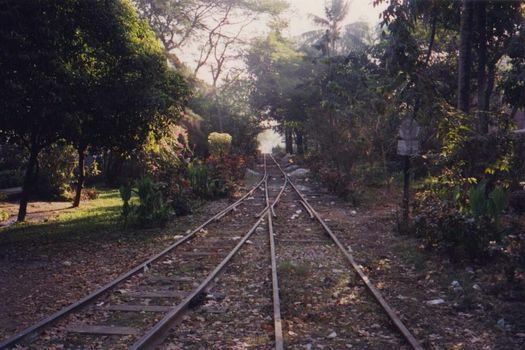 Railroad tracks run along the waterfront, known as the Strand. The tracks are a spur line: the city's main station lies four superblocks to the north, where the grid is replaced by a more free-form street pattern. 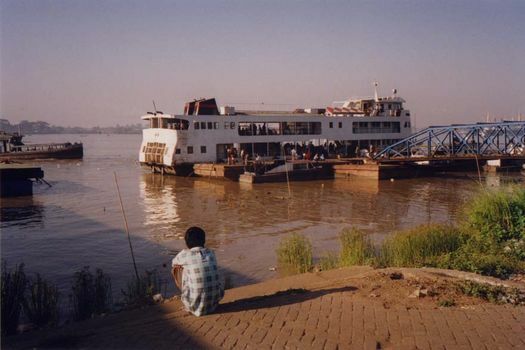 Trains run up the Irrawaddy as far as ferries go in the wet season, which is to say to Myitkyina. We'll just walk along the Strand, starting at this former post office, a nice Edwardian relic. 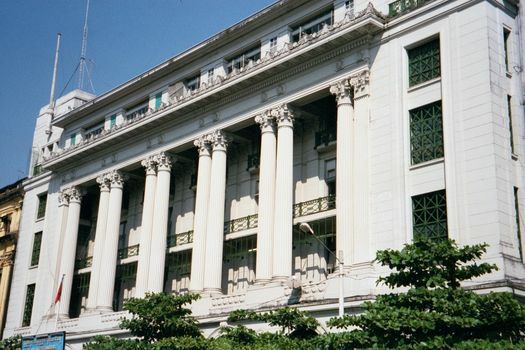 Today it houses Branch Three of the Myanmar Economic Bank. 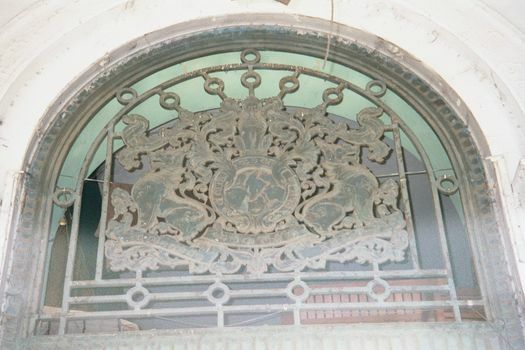 A detail of the same building, to catch the date. 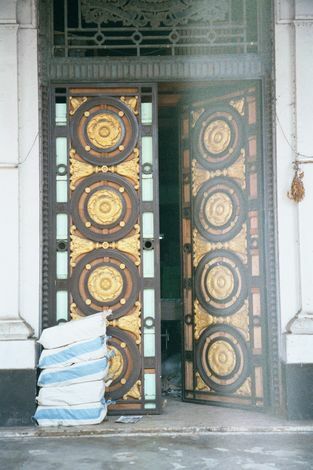 A bit of wrought iron on the same building. 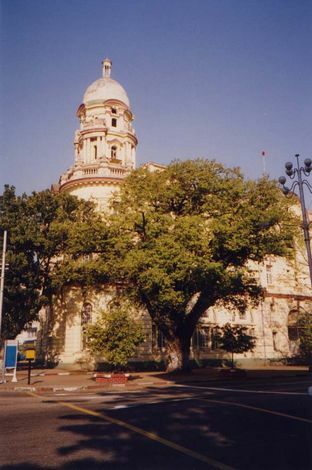 Just down the street, the Customs building, formerly the High Court. Nearby is this plaque. 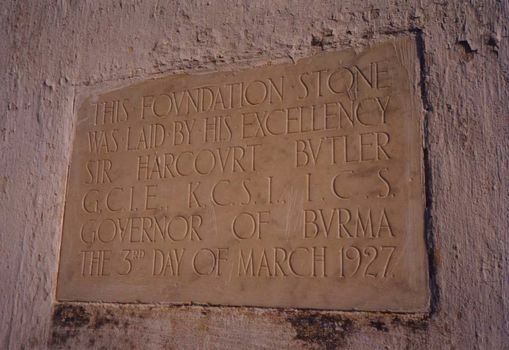 The string of initials after his name stands for Grand Commander of the Indian Empire, Knight Commander of the Order of the Star of India, and Indian Civil Service. That last may seem rather a comedown, but the ICS formed what the British were pleased to call the "steel frame" of their administration, and the letters still have a certain cachet. 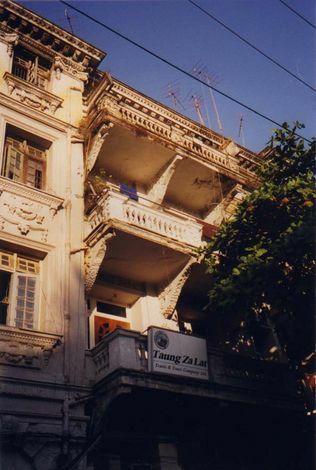 (See, for example, the last pictures in Myanmar 3: Colonial Houses in Mawlamyine.) According to David Gilmour's The Ruling Caste, Lady Butler told her husband's under secretary: "Mr. Lupton, never leave me in the room with Harcourt." Butler himself said that though he had been married for many years, he had not lived with his wife for more than a total of eight days. 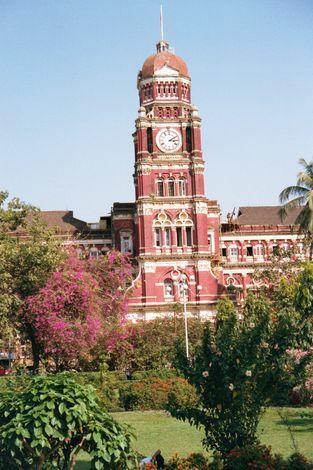 Butler was popular, however, with the British residents of Rangoon: after all, he liked horse racing. Across the street: the Port Authority building, formerly the Port Trust. The street is called Pansodan--in the British period it was Sparks. 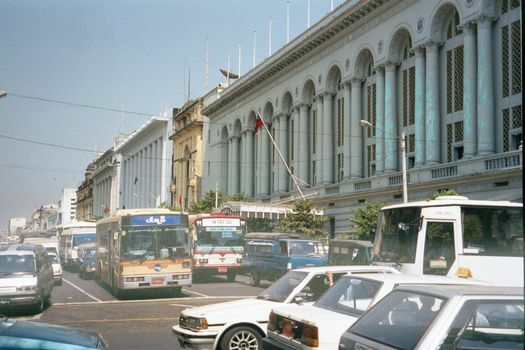 The neoclassical lineup includes the Port Authority in the foreground, the Agricultural Development Bank, the Ministry of Information, and the Ministry of Inland Waterways. Here's that Inland Waterways building. 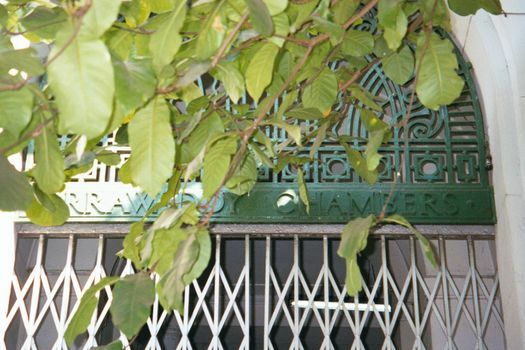 "Irrawaddy Chambers." 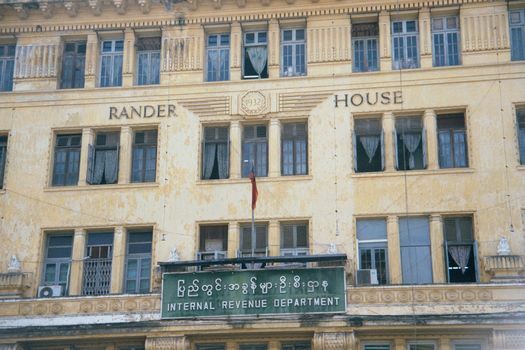 This was the headquarters of the famous Irrawaddy Flotilla Company, whose famous fleet was completely and deliberately sunk as Burma fell into Japanese hands. Across the street, another emblem of colonial capitalism, again taken over for government purposes. 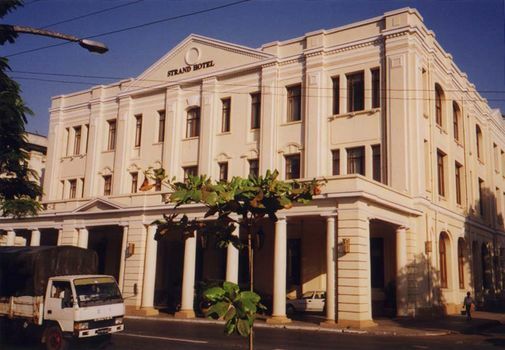 Back along the Strand, this is the city's famous colonial hotel. 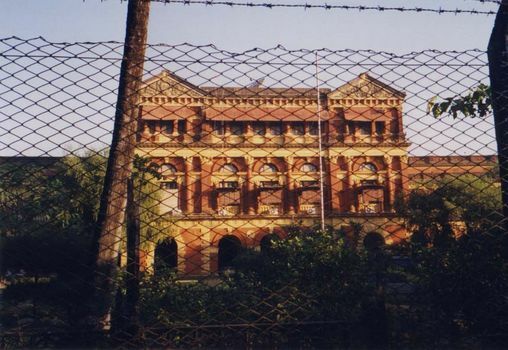 It spent two generations slowly decaying after the British left Burma in 1948, but it's been elaborately restored. In comparison to hotels like the Raffles in Singapore or the Oriental in Bangkok, it's muted, almost self-effacing, at least until you check the rates. 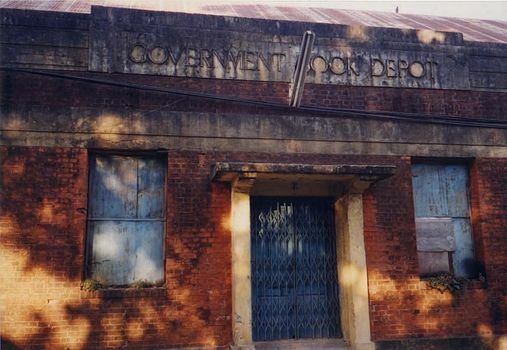 Still further along the strand, the main post office. 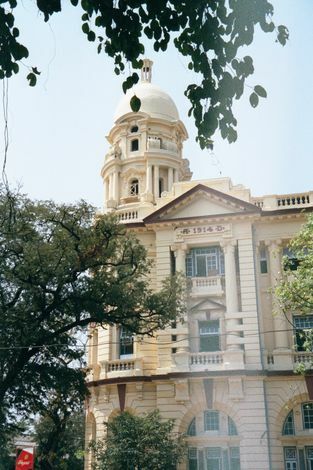 We've moved away from the Strand now and are in the middle of the grid, standing in Maha Bandoola Garden (formerly Fytche Square) and looking at the courthouse, built about 1920. 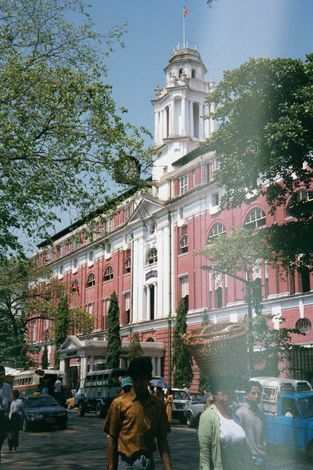 Two superblocks to the east, this is the old British secretariat. 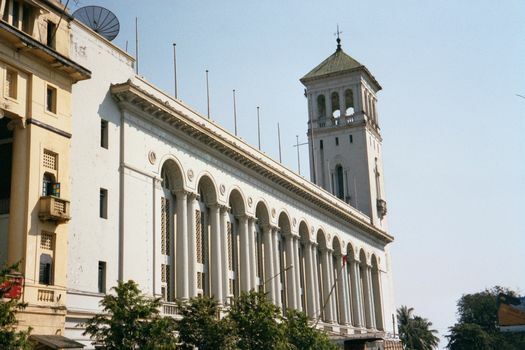 It later housed offices for agriculture, labor, education, planning, and other ministries. 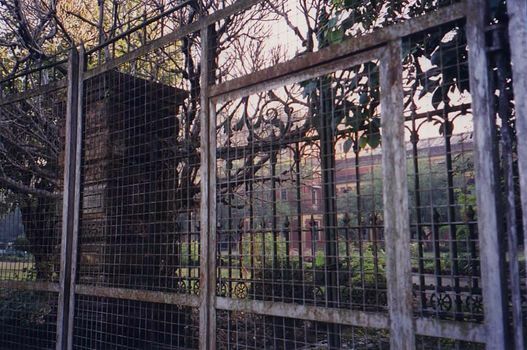 Was the fence present in the days of British rule? Not a chance. The hated imperialists left and the country gradually lost the freedom it thought it had won. Visit the minister of your choice. 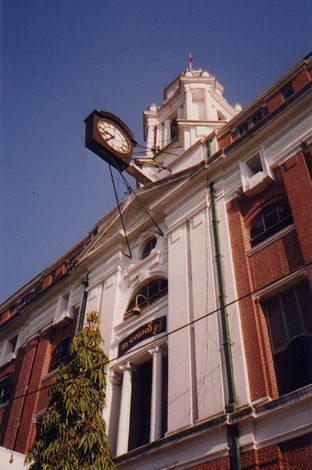 A more modest government building of the British era. Commerce is a lot safer than books. 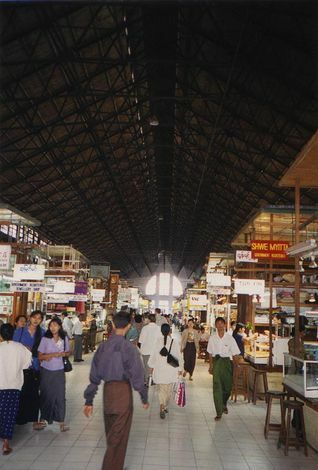 These are the sheds of the Bogyoke Aung San (formerly and still familiarly the Scott) Market, west of the central railway station. 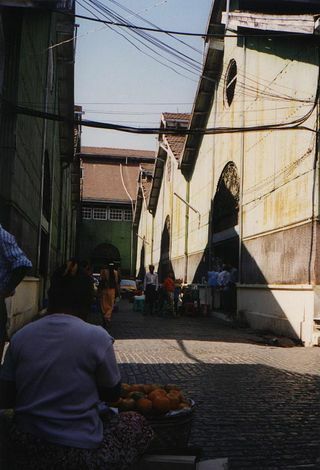 The same market from the outside, showing the corrugated-metal sheds that house the place. 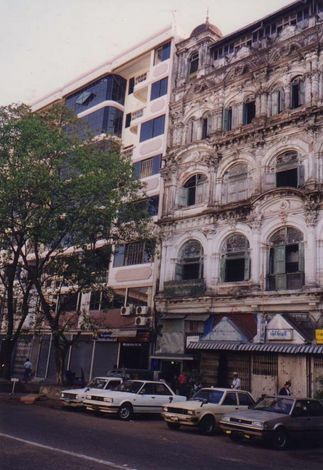 Despite European dominance, Rangoon was primarily a city of Indian immigrants, the huge majority of whom lived in densely packed apartment buildings. Some of these buildings were ostentatiously grand. 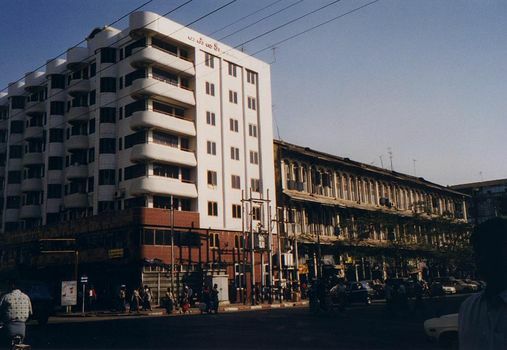 Most of the buildings are still standing, however. Here and there, new buildings have been added. Another juxtaposition of old and new. New buildings soon look as bedraggled as the old ones. 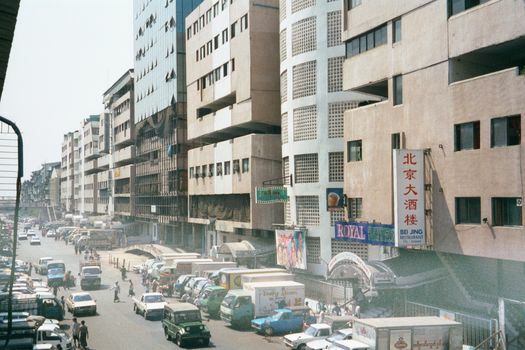 One of the most modified of the downtown streets: Shwe Dagon Pagoda Road, formerly--and for good reason--China Street.